Mix first 4 ingredients, then slowly add in the hashbrowns. Salt the mixture and stir, then pour into large casserole dish. Sprinkle the crumbled ritz crackers over the mixture. Pour melted butter over the ritz crackers. 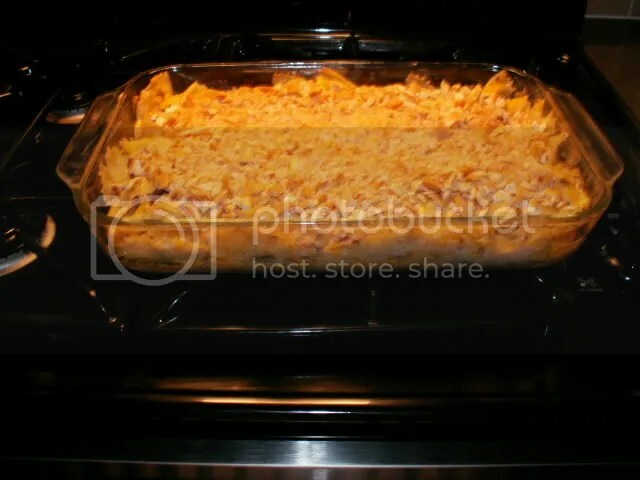 Cover casserole dish with aluminum foil. VARIATIONS I like to make: when mixing in first 4 ingredients, either mix in 1 lb browned cooked hamburger meat, 1 lb browned cooked sausage, or 1 lb diced, cooked chicken breasts…can divide into two medium size casserole dishes when adding these ingredients instead of one large casserole if desired…another variationn I love is as follows:take approx 1 lb boneless, skinless chicken breasts and dip in 2 slightly beaten egg yolks, then dip in flour mixed with season-all for taste…brown lightly in canola or veg. oil on both sides on stove top in skillet. Line bottom of casserole dish with pieces of fried chicken (not totally cooked). Top with grated cheese, and then remaining hashbrown casserole mixture and bake as specified above. YUM!!! Crush the crackers and potato chips together. Mix these with the ground turkey. Cut the onion in small pieces and saute with the garlic in one tablespoon of olive oil. Pour this mixture in with the meat. Add the remaining ingredients and mix well. Grease a small baking pan and place mixture in the pan. Spread a small amount of spaghetti sauce in a thin layer all over the meatloaf. Cover this with shredded cheddar and mozzarella cheese. Bake on 350 degrees for about 45 minutes. 2 Add ground beef, onion, and garlic; stir to crumble beef; cook 4-5 minutes or until the beef is browned; drain. 3 Transfer meat mixture to a mixing bowl. 4 Add in the soup, pasta sauce, 1/2 cup cheddar cheese, spaghetti, and 1/2 cup water; stir to combine. 5 Season to taste with salt and pepper. 6 Transfer spaghetti-meat mixture to greased (with non-stick cooking spray) 13×9 inch baking dish. 7 Sprinkle with all but 1 tablespoon cheddar cheese and 1-2 tablespoons parmesan cheese over the top. 8 Bake at 400° for 18-20 minutes or until bubbly. 9 Sprinkle with remaining cheese; serve immediately. Cook penne according to directions and drain. Cook ground beef and onion in a large skillet. Drain off fat, then add chili powder, diced tomatoes, tomato sauce, salsa and chilies, and cook for about 5 minutes. Toss pasta and sauce together and spoon into a 13×9-in. baking dish. Top with the cheese and bake at 350 degrees for 20 minutes, then serve. I am not sure where this particular recipe came from originally because it was on a fax to Freda’s work in 2008. However, since she had it in her recipe box, I am calling it “Freda’s Hamburger Casserole”. I tried it for supper this evening. It was super-easy and was very good. I wrote a note at the end to show what I did different than the recipe. 2 lbs ground beef sautee’d with chopped onion….brown and drain. OPTIONS: top with chopped bread crumbs that have been browned in skilled of butter, or use croutons. 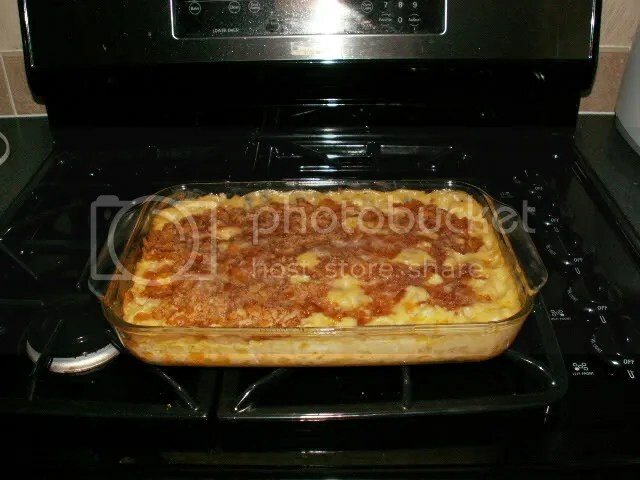 NOTE FROM TERESA: I made this casserole as pictured with ritz crackers crumbled in butter for the topping…bowtie noodles instead of egg noodles…sprinkle a bit of coarse California sea salt into the mixture before baking and add about 1 cup extra cheese just because it’s yummy. It took about 30 minutes to bake and it turned out GREAT! Put 1/2 herb season mixture in bottom of casserole dish. Layer with the squash mixture. Add remaining stuffing mixture on top.